It’s been a full week! Full of fun, for sure. 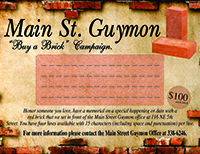 Last week we had our Main Street Guymon Taco Dinner and Bingo Evening fund raiser. It went really well. I am so grateful to all those who worked and planned, made salsa and desserts, those who came. And especially to the Guymon Swim Team. The Swim Team came and ate tacos and then played bingo. They made up a very large part of our crowd. I hope they had fun. We sure were proud to have them there. Makes me think I might have to go to a crazy swim meet! But to make it even better, Bianca Hernandez was a young swimmer that won $23 in Bingo. She donated the money to the Guymon Gators scholarship fund. This is a scholarship that goes to a swimmer based on academic achievement and leadership ability. Bianca, whether she wins at the swim meets or not, is a winner. Her parents should be proud of their daughter. I am and I don’t even know her! So on my Fan List (which includes the Denver Broncos and OKC Thunder) I now add the Guymon Gators. Talk about being a fan, I just read the book “Winter Garden” by Kristin Hannah. It was so good that over the weekend I looked for others from the author. And found one! You know, I bought two sacks of books at the Used Book Store … and never got past the first aisle. There are some things I can really do well and buy books is one of them. Here are a few things to think about … 1. If you have kids that are acting bored and have all their chores done, consider the YMCA Day Camp. There are weekly rates. Call 468-YMCA to get that moving! 2. Do you need help hauling trash off? If you do, call Main Street Guymon at 338-6246. We do appreciate donations, but there isn’t a charge. 3. The Chamber of Commerce Golf Scramble is July 12. You need to have a team in it! Support a wonderful organization … call 580-461-2655. 4. Also on July 12 is the Women’s Ranch Rodeo. This is going to be great! Call 580-651-4510 for more information. 5. The Professional Bull Riding event is July 26. That is going to be some sort of fun! You can get your tickets at the Chamber, all PTCI locations, XIT For and Hart Dodge in Dalhart, Crazy House in Liberal. Don’t miss this one! 6. And for runners, you need to sign up for the Aug. 2 Green Jean Run. It all goes to a good cause. Now, your goal for the week (if I can be so obliging as to assist with setting your goals) is to decide to be happy this week. Abraham Lincoln said, “I have found that most people are about as happy as they make their minds up to be.” My dad told me that “Happiness is a decision. It doesn’t matter what you have or who you’re with, you can decide to be happy.” My dad and Abraham Lincoln seem to be a lot alike. But my dad doesn’t have a beard. Here’s another one. Be a beautiful person. The sign of a beautiful person is that they always see beauty in others. See all you beautiful people on the bricks!